Here you will find transfers from Barcelona or Girona airport with privately booked drivers. So you get easy and comfortable to Barcelona's downtown by taxi, people carrier or coach. With our Arrival Tour you will get a sightseeing tour through Barcelona and a private transfer to your hotel. Further, we have put together information about Barcelona and Girona airports and how to get to the city or airport by public transport. Private transfers for each group size or for individuals. We pick you up directly in the arrivals hall. Here you book a Transfer + City Tour in a package from Barcelona airport or cruise port. On request with breakfast or tapas break. Barcelona’s airport - El Prat de Llobregat, or just "BCN" – is about 15 kilometers outside of the city. There are several possibilities for a transfer from the airport to the inner city available: the Aerobus, the buses 46 and N17, by train, by taxi or private transfer. 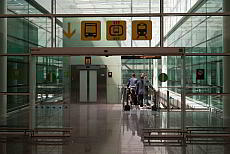 The airport "Girona - Costa Brava" (GRO) is located about 80 kilometers from Barcelona. 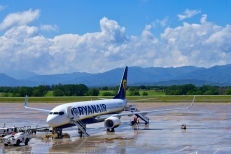 Girona is primarily a hub for Ryanair. From Girona you can easily travel with a shuttle bus to Barcelona in about 70 minutes. If you want to arrive comfortably and safely at your accomodation or on your departure day at the airport without any major planning, we recommend booking an airport transfer in advance via our website. Depending on the number of people we arrange you a taxi, people carrier or for larger groups also coaches. With our airport transfers from Barcelona Airport and Girona Airport, you can get relaxed to your accomodation without any hassle or planning and back as well. Depending on how many people you are we arrange you a taxi, people carrier or for larger groups also coaches. Our Arrival City Tour offers you both the transfer from Barcelona airport and city tour in one. Our English-speaking driver and guide will pick you up in the arrival hall and show you the most important squares and monuments in Barcelona. After that, he will take you to your accomodation. So you get an nice overview and can relax to celebrate your arrival with delicious tapas! Take advantage of you last day with our Departure Excursion: Our English-speaking guide will accompany you to the famous Montserrat Monastery. 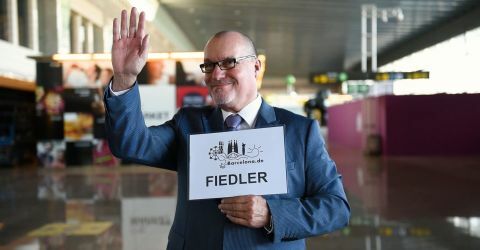 Finally he will take you without any stress to Barcelona Airport.